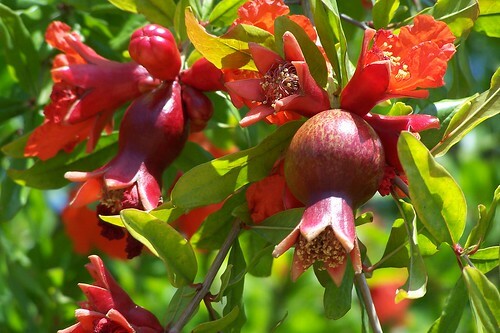 One of the prettiest flowering shrub or small tree is the pomegranate tree Punica granatum. Those fortunate enough to live in a climate warm enough- zones 7 to 10- to be able to grow the pomegranate tree outdoors have seen the flowers, which are attractive scarlet, white or variegated flowers that are over an inch across and have 5 to 8 crumpled petals and a red, fleshy, tubular calyx which you see remaining at the top of the fruit. The flowers may be solitary or grouped in twos and threes at the ends of the branches. Even Aesop, the famous writer, wrote a delightful fable about the beauty of the Pomegranate tree entitled, The Pomegranate, Apple – Tree and Bramble. However, TheGardenLady has read that archeologists have proved that the earliest pomegranate was found in Jericho. In the Bible there are 19 verses containing the word “pomegranate”. Many scholars suggest that it was a pomegranate tree, not an apple tree, that was in the biblical Garden of Eden. There are four trees mentioned in the Koran as where the pomegranate tree is mentioned 3 times (see here). And it is one of the four trees the Koran says is present in Paradise: the fig tree, the olive, the pomegranate and the date palm. This is the season for pomegranates in the supermarket. These are not only fun fruits to eat, they are really believed to be super health foods. So those celebrating holidays in the fall, like the Iftar dinner after Ramadan for the Moslems or the Rosh HaShanah feast for the Jewish people or during Thanksgiving for Americans or other fall festivities in other countries, consider adding something containing pomegranates- either as decoration for the table or as a food. Remove the seeds from two pomegranates- Martha Stewart recommends that you use a paring knife to cut slightly into the skin all the way around, and then break the pomegranate in half (or thereabouts) by hand. Then working over a deep bowl, hold the fruit seed-side down and take a long wooden spoon and smack the back of the fruit repeatedly. Every seed should fall into the bowl. To the pomegranate seeds add one stalk celery chopped, 1/2 Tablespoon minced fresh ginger, 1 to 2 Tablespoons honey, 1 teaspoon lemon zest, 1 Tablespoon olive oil and 1 1/2 Tablespoon orange juice. Sprinkle with one minced green scallion- bulb and green part, salt and pepper to taste. (optional, mince some jalapeno pepper to add). Combine and refrigerate for a few hours before serving. Grow the tree yourself and you can raise your own pomegranates. There are many nurseries that sell pomegranate trees. They are easy to raise, not affected by any serious diseases and are very long lived trees. (see here) They are self pollinating so that you don’t need two trees. Many nurseries in the North carry the shrub or tree but it is half hardy and should be kept indoors in cold weather if you are in Zone 6 or colder. The dwarf pomegranate is easy to cultivate indoors. Use a good-quality potting soil amended with lime, and plant in a terra-cotta container. Let the soil dry out between waterings, and don’t let the pot sit in a saucer of excess runoff. Fertilize it regularly in spring and summer. The dwarf pomegranate shrub is ideal for bonsai.